Longer life times, larger ranges and faster recharging – developments such as electric mobility or the miniaturisation of electronics require new storage materials for batteries. With its enormous storage capacity, silicon would potentially have decisive advantages over the materials used in commercial available lithium-ion batteries. But due to its mechanical instability, it has so far been almost impossible to use silicon for storage technology. A research team from the Institute for Materials Science at Kiel University, in cooperation with the company RENA Technologies GmbH, is developing anodes made of 100% silicon, as well as a concept for their industrial production. Through targeted structuring of its surface at the micrometer level, the team can fully exploit the storage potential of silicon. This opens up a completely new approach to rechargeable batteries, as well as the energy storage of tomorrow. This week, the partners are presenting the production and potential use of silicon anodes at the Hannover Messe (23 – 27 April), at the CAU booth (Hall 2, C07). Silicon has long been a potential candidate for the e-lectric mobility, according to materials scientist Dr Sandra Hansen. „Theoretically, silicon is the best material for anodes in batteries. It can store up to 10 times more energy than graphite anodes in conventional lithium-ion batteries.“ Electric cars could drive further, smartphone batteries could last longer, and recharging would be significantly faster. An additional advantage of the semiconductor material is its unlimited availability – after all, sand consists largely of silicon dioxide. „Silicon is the second most abundant element on earth after oxygen, and thus an almost unlimited cost-effective resource,“ said Hansen. 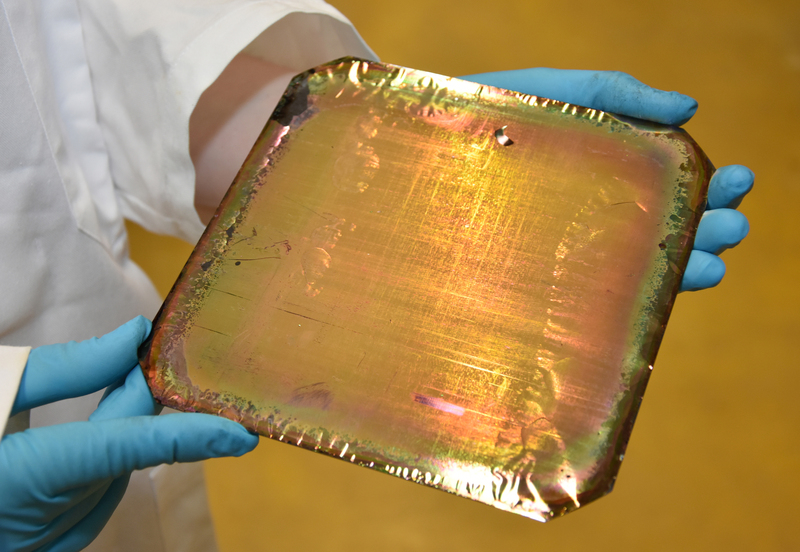 At the Institute for Materials Science in Kiel, silicon has been researched for almost 30 years. The findings to date, combined with the silicon experience of RENA Technologies GmbH gained from solar technology, should contribute to producing battery anodes made from 100% silicon. This would enable maximum use of their storage potential – anodes in conventional rechargeable batteries contain only approximately 10-15 percent silicon. To pursue this goal, the joint research project „Development and characterisation of large, porous Si film anodes for lithium-sulphur-silicon energy storage“ (PorSSi) kicked off last year, which has gained a total of one million Euros in funding from the Federal Ministry of Education and Research (BMBF, more details see below). The result at the end should be a high-performance silicon battery, along with a concept for its cost-effective industrial production. „In order to increase the cycling stability of silicon anodes in batteries, we need to understand exactly what happens when they expand while charging,“ said Hansen. During her PhD thesis, she discovered that silicon behaves much more flexible when it is produced in the form of a thin wire. These findings are now transferred to porous silicon – its free volume leaves more space for expansion. To prevent the contacts with the electrode from breaking, Hansen has co-developed and patented a method for a stable connection between the two. The team wants to manufacture the counterpart to the anode – the cathode – from sulphur. „A sulphur cathode provides the maximum possible storage capacity. So in this project, we combine two materials that promise really high performance from the battery,“ said Hansen. „At the moment, this process still takes a long time and is very expensive. If we can manage to transfer it from a silicon wafer to a porous film, we could etch them in just a few minutes,“ said Hansen. Through the cooperation with RENA, the research findings flow directly into the development of new etching systems. A prototype will be produced in the course of the three-year project period, and installed at the Faculty of Engineering in Kiel. The Kiel research team manufactures anodes for their innovative silicon batteries from silicon wafers like this one. An etching process gives the originally blank discs a porous surface – and a colourful sheen. 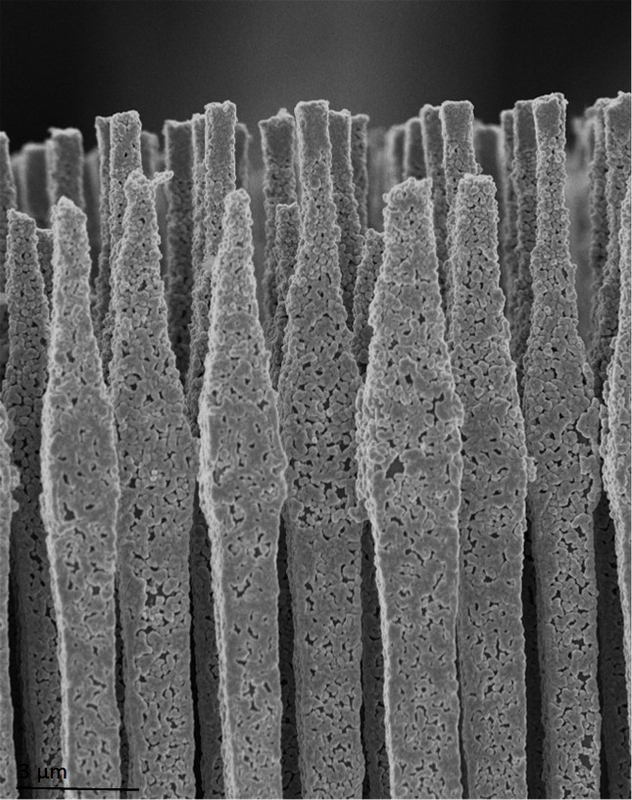 The porous silicon layer can be bonded particularly well with a copper electrode. The resulting extremely thin anode can be peeled off like a film. 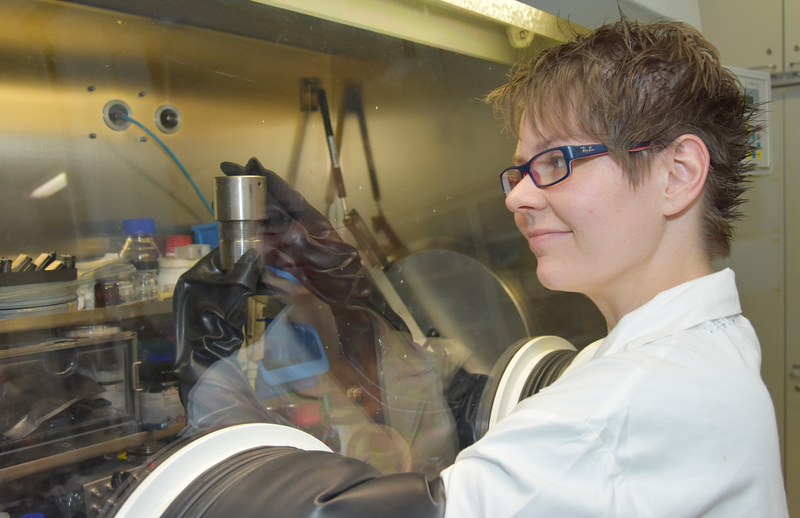 In the laboratory at the Faculty of Engineering, Hansen is constructing the first prototypes of silicon batteries, to test how many charge cycles they can last. There is no oxygen in this so-called „glove box“, otherwise the lithium in the battery would oxidise. When charging the battery, silicon expands by 400 percent, and the delicate material could break. It is much more flexible in the form of such micro-wires, as Hansen was able to prove in her doctoral thesis. But this kind of manufacturing is still too expensive for industrial production. During the whole week Dr. Sandra Hansen presents their new approach how to fabricate silicon anodes at the Hannover Messe. 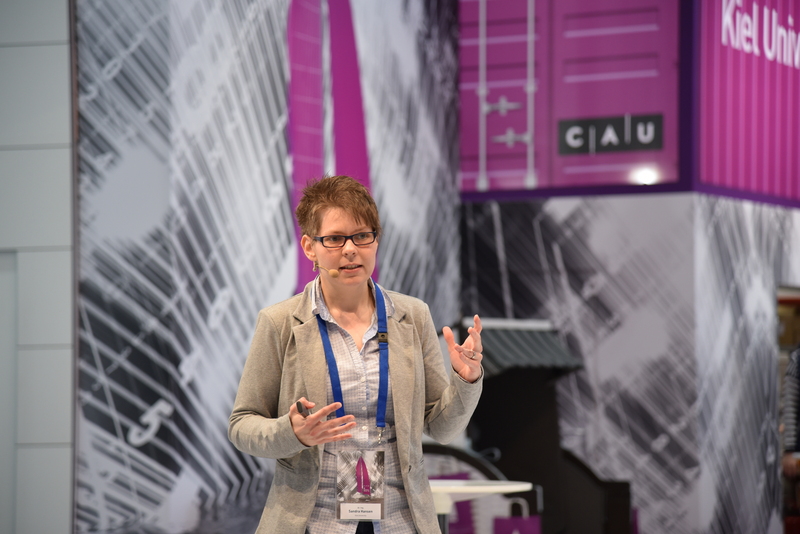 In 2018, Kiel University (CAU) will once again present its excellent research at the Hannover Messe. Under the motto „Ways to Solutions“ the state university demonstrates: science affects society in many different ways. It contributes to exchanges, solves tricky problems and creates new scenarios. All this awaits guests in Hall 2 (Research & Technology). This time, together with our partners: State of Schleswig-Holstein, the City of Kiel and the European XFEL. Participation at the trade show will focus on presentations and exhibits associated with cutting-edge research, the transfer of knowledge, patents and initiatives to establish companies. Presentations and panel discussions will round off the varied programme during the week. All details can be found at http://www.uni-kiel.de/hannovermesse/en.